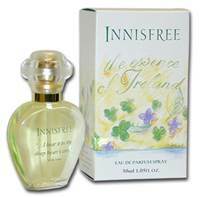 This Irish perfume is named after the Lake Isle of Innisfree, a small island in Lough Gill in County Sligo which was the subject of a beautiful poem by Yeats. A copy of this poem is tucked inside the box and the final line is embossed on the heart-shaped bottle. It is a magical fruit and floral fragrance: the top notes are an accord of Lily of the Valley and Peach, Blackcurrant and Apricot, together with Lemon, Bergamot and Lavender. The middle notes are an accord of Jasmine, Rose and Iris constructed on a smooth foundation of Sandalwood, Cedarwood and Musk base notes. 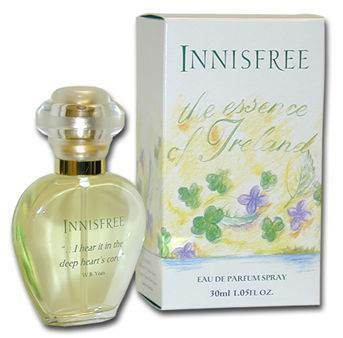 The overall effect of the fragrance is lightness, freshness and a youthful zest which develops into a classically elegant and very rich woody-floral perfume of great depth and transparency, which conveys Ireland’s purity of spirit and its magic.